Can Children & Teens Get Their Teeth Whitened? 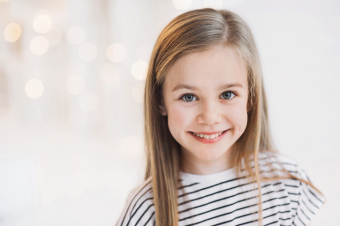 Our Surrey dentists advise against teeth whitening for children for a few important reasons. Parents sometimes express concerns about the dark or yellowish colour of their children's newly erupting adult teeth and wonder if it teeth whitening may be a solution. 1. There may not actually be a problem. Erupting adult teeth have significantly more dentin in them than the baby teeth do. Dentin is the layer of the teeth that is just under the enamel. Dentin is yellow, and can make the adult teeth look significantly more yellow than the remaining baby teeth. In short, it is normal and natural for adult teeth to appear more yellow than baby teeth. Once all the baby teeth have fallen out, the darker colour of the adult teeth will be much less obvious. 2. We have little data on the impact whitening products have on developing teeth. The fact is, we really don’t know how teeth whitening may affect teeth that are not yet finished growing and developing. There simply isn’t a reliable body of evidence and data available for us to make an informed decision about whether teeth whitening is safe for children’s teeth. Rather than risk adverse side effects for children, our dentists typically only prescribe teeth whitening for patients in the late teen years or adults. If you have questions about your child’s developing teeth or teeth whitening in general, please contact our Surrey dental office today!